Versatile sport performance. 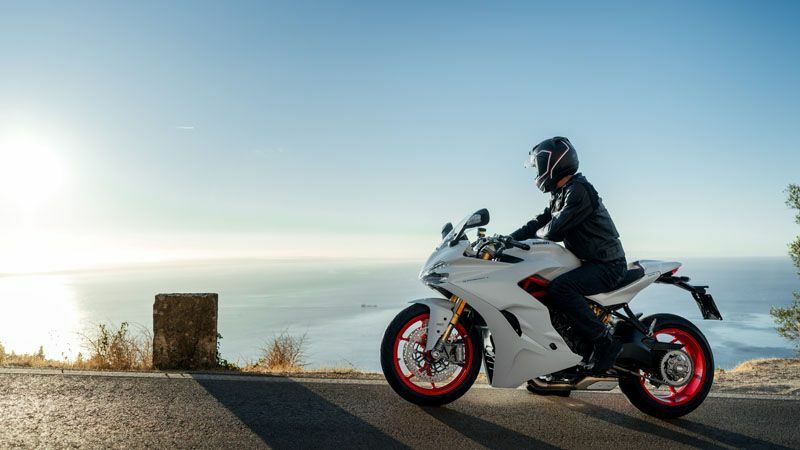 The SuperSport blends comfort with versatility thanks to solutions that make it perfect for everyday road riding – but without ever compromising its sporting spirit. The following features include information for all models within the Supersport Family and may not be applicable to all models. Please see your local dealer for further information. TAILOR MADE ERGONOMICS: Extreme attentiveness to the ergonomic triangle, aerodynamic protection and the rider's freedom of movement has resulted in comfort, versatility and jaw-dropping sports handling. 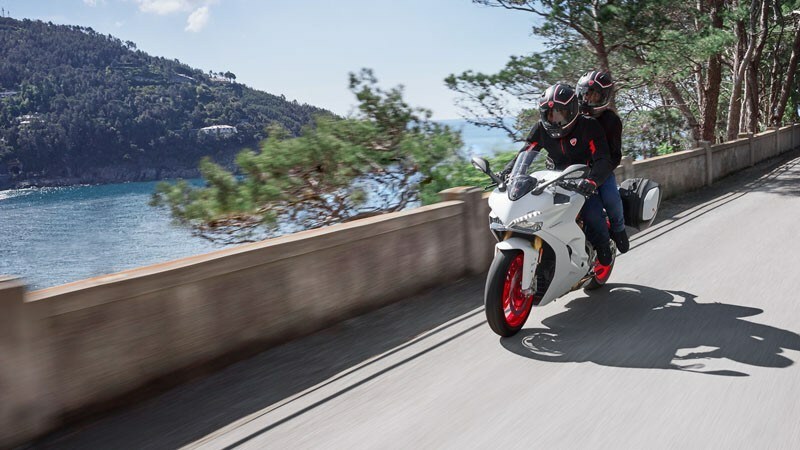 Extreme attentiveness to the ergonomic triangle, aerodynamic protection and the rider's freedom of movement has resulted in comfort, versatility and jaw-dropping sports handling. The rider zone of the one-piece seat is just 810 mm off the ground, allowing feet to be placed firmly on the ground. Handlebar height does not place undue strain on the wrists and foot peg positioning prevents knees becoming tired while maximising control. The height-adjustable Plexiglas screen can be set to two different positions over 50 mm of travel, ensuring adequate airflow protection even at motorway speeds; enhanced protection can be had by fitting the larger Plexiglas touring screen, available as an accessory. 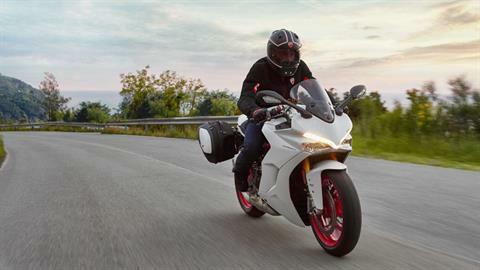 Comfortably separated rider and passenger footpegs and a snugly compact lateral silencer ensure maximum freedom of movement. The benefits of the riding position are evident during both everyday and medium-length journeys and also ensure fun-packed sports riding. 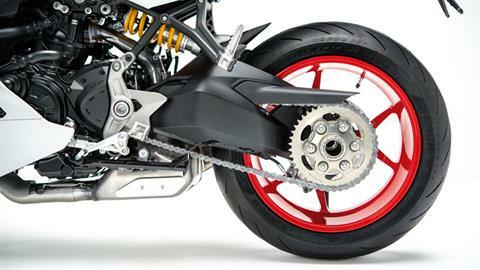 Y-PATTERN 3-SPOKE WHEELS: The sporty attitude of theSuperSport is emphasized by its very aggressive sport rim design. The bike has Y-pattern 3-spoke wheels in lightweight aluminum. 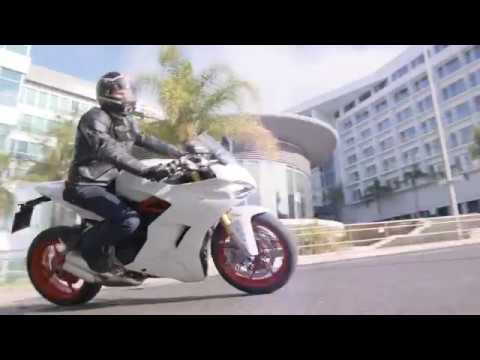 The sporty attitude of theSuperSport is emphasized by its very aggressive sport rim design. 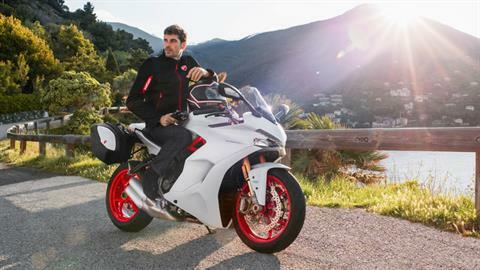 The bike has Y-pattern 3-spoke wheels in lightweight aluminum. TYRES: The wheels mount the new Pirelli Diablo Rosso III tyres, 120/70 ZR 17 at the front and 180/55 ZR 17 at the rear. The wheels mount the new Pirelli Diablo Rosso III tyres, 120/70 ZR 17 at the front and 180/55 ZR 17 at the rear. 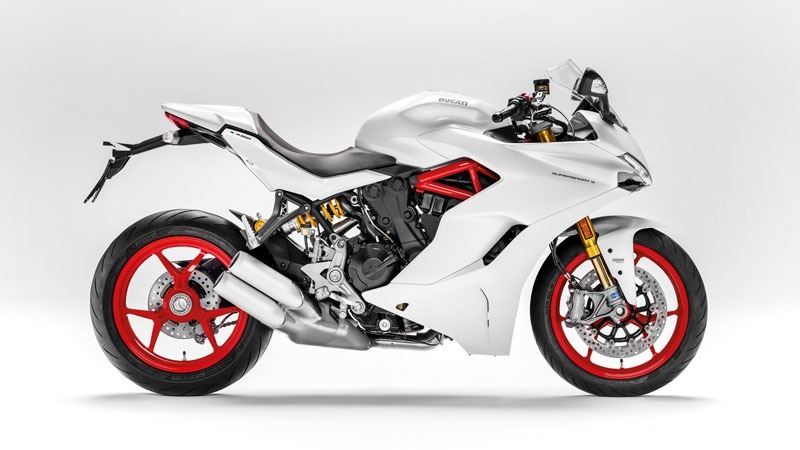 SINGLE-SIDED SWINGARM: The SuperSport features a strong die-cast aluminium single-sided swingarm that ensures high rigidity, low weight, and excellent stability, providing also a technical and professional look. 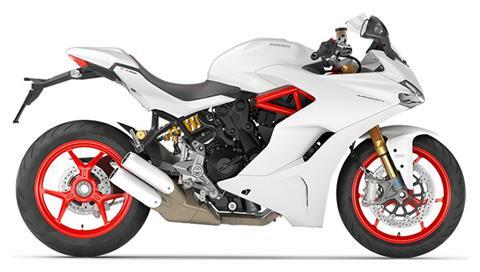 TESTASTRETTA 11°: The SuperSport is powered by a specially adapted version of the already renowned and appreciated 937 cm3 twin-cylinder Ducati Testastretta 11°. "The SuperSport is powered by a specially adapted version of the already renowned and appreciated 937 cm3 twin-cylinder Ducati Testastretta 11°. Euro 4-rated, it has four valves per cylinder, a secondary air system, liquid cooling, a 12.6:1 compression ratio and bore and stroke measurements of 94 and 67.5 mm respectively. Engine output amounts to a huge 110 hp at 9, 000 rpm and a maximum torque of 93 Nm at 6,500 rpm. On the SuperSport, the Testastretta 11° engine features crankcase and cylinder heads that have been redesigned to make the power unit an integral part of the frame; further modifications include re-routing of the water through the heads and a specifically designed alternator cover to allow installation of the new gear sensor. Large 53 mm throttle bodies - smoothly controlled by the full Ride-by-Wire system - allow the engine to gulp in the air-fuel mix. Moreover, this engine also features unprecedented control and injection systems. DUCATI QUICK SHIFT (DQS): The Ducati Quick Shift (DQS) up/down is an electronic system derived from racing that allows for gear changing and shifting without using the clutch and without closing the throttle when up-shifting. 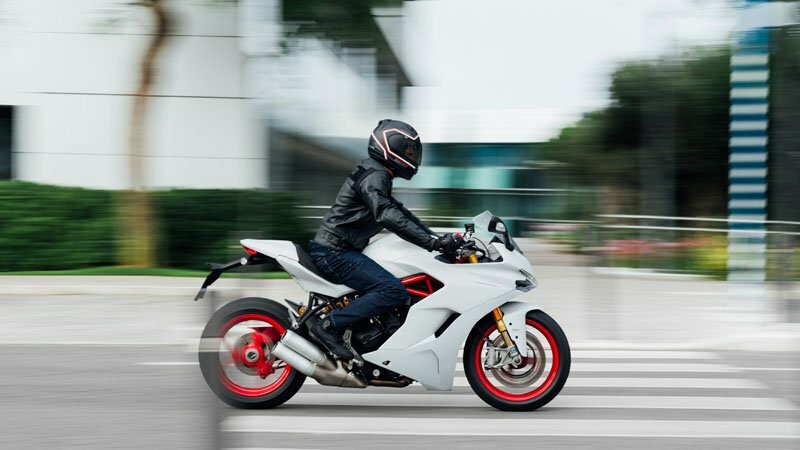 The Ducati Quick Shift (DQS) up/down is an electronic system derived from racing that allows for gear changing and shifting without using the clutch and without closing the throttle when up-shifting. Helping the rider to save precious seconds in acceleration and avoid distractions during corner entry, the system is particularly useful in city traffic, while also ensuring greater enjoyment during sports use. SERVICE INTERVALS: Careful engineering and top-quality materials achieved results better than main competitors. Scheduled valve clearance adjustment is every 30,000 km, and the mainteneance interval is every 15,000 km, providing greater ease and lower cost of ownership. DUCATI TRACTION CONTROL (DTC): Ducati branded DTC offers a choice of eight profiles, or ‘sensitivity levels', each one programmed with a wheel-spin tolerance matched to progressive levels of riding skill, graded from one to eight. 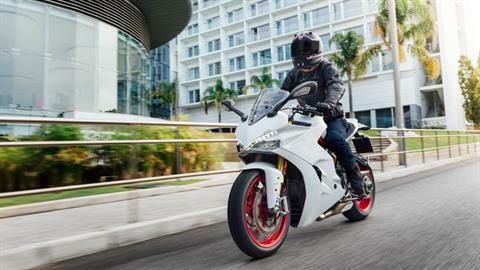 Ducati branded DTC offers a choice of eight profiles, or ‘sensitivity levels', each one programmed with a wheel-spin tolerance matched to progressive levels of riding skill, graded from one to eight. ABS (ANTI-LOCK BRAKING SYSTEM) 9MP: The ABS system is the 9MP multi-calibration ABS, meaning the rider has the possibility to switch from one configuration to another by selecting the appropriate Riding Mode. 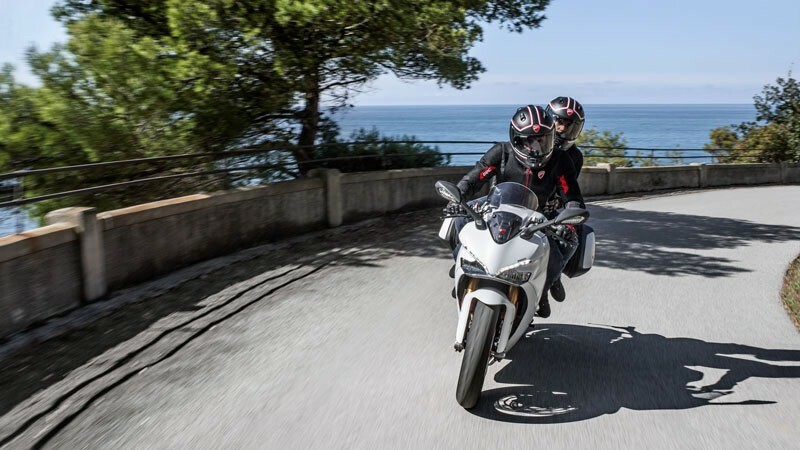 The ABS system is the 9MP multi-calibration ABS, meaning the rider has the possibility to switch from one configuration to another by selecting the appropriate Riding Mode. 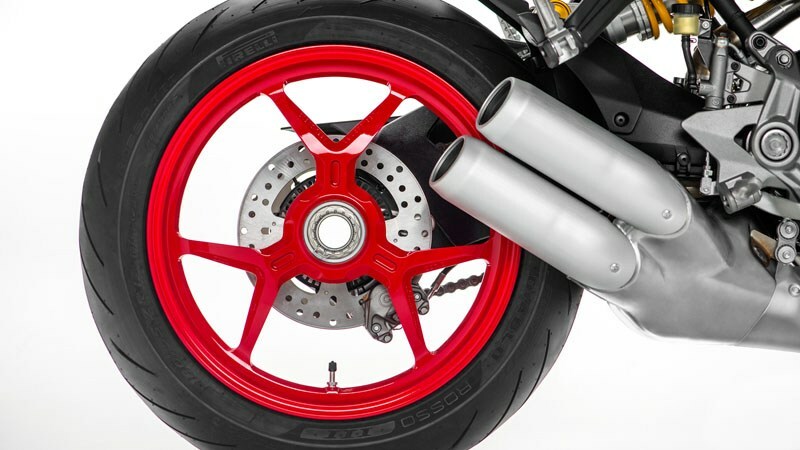 9MP ABS prevents front and rear wheels from locking, and has refined rear wheel lift-up prevention to offer the shortest stopping distance and high stability by using the information of a sensor measuring pressure at the front wheel caliper. ABS can be deactivated if the rider wishes. ABS-Off can be loaded as a configuration of a riding mode and is maintained after switching the key off. FULL-LCD INSTRUMENT PANEL: The SuperSport's compact instrument panel has lights on the upper part of the dashboard for warnings relating to neutral, indicators, full beams, engine rpm limit, oil pressure and fuel reserve, while the lower part is comprised of an LCD display with a DOT-Matrix area to display all the other data. 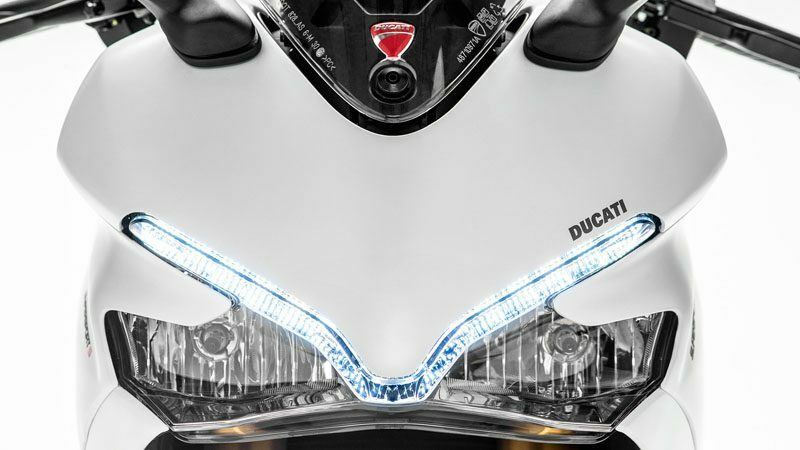 The SuperSport's compact instrument panel has lights on the upper part of the dashboard for warnings relating to neutral, indicators, full beams, engine rpm limit, oil pressure and fuel reserve, while the lower part is comprised of an LCD display with a DOT-Matrix area to display all the other data. The display gives information about speed, rpm. totaliser, trip1 and trip2, engine cooling liquid temperature, ambient temperature, clock and gear engaged. In addition, it displays present fuel leve, fuel consumption, average fuel consumption, average speed and duration of trip. The DOT-Matrix area permanently displays the Riding Mode selected and the corresponding ABS and DTC levels set. 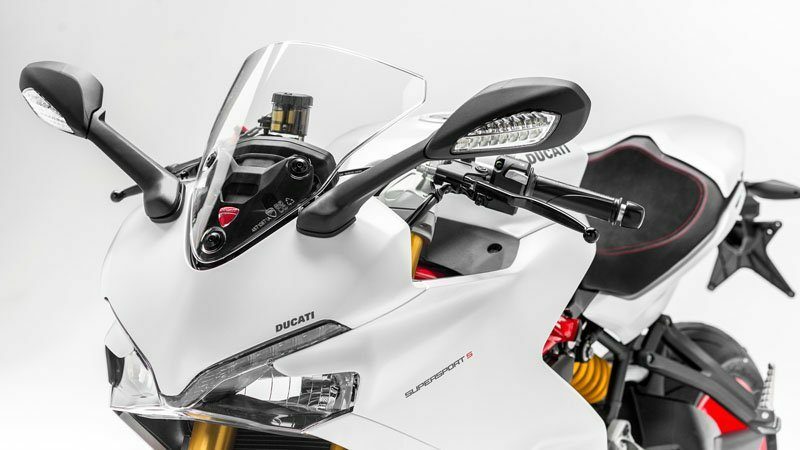 ADJUSTABLE WINDSHIELD: The Plexiglas screen can be adjusted with just one hand; riders can raise it 50 mm and so obtain better airflow protection. Front - Y shaped, 3-spoke in light alloy, 3.5 x 17 in. Rear - Y shaped, 3-spoke in. light alloy, 5.5 x 17 in. 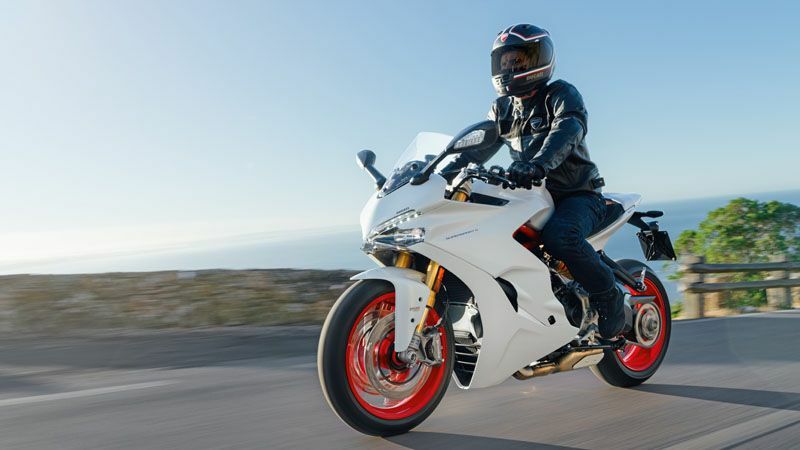 Notes on power / torque - The power / torque values indicated are measured using an engine dynamometer according to homologation regulation and they correspond to the homologated data, as quoted in the Bike Registration Document.